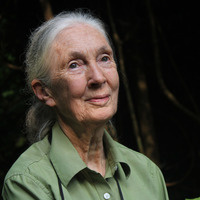 Join Dr. Jane Goodall for a special speaking event at FAU! Dr. Goodall, DBE and UN Messenger of Peace, will share her insights on the importance of protecting species and the natural world, while encouraging every individual to do their part to make a difference every single day. As a trailblazer in animal behavioral research, Dr. Goodall's groundbreaking studies are now the Guinness World Record's longest continuous study of chimpanzees, offering a remarkable window into the lives of our closest relatives and our relationship to the rest of the animal kingdom. As founder of the Jane Goodall Institute (JGI), Dr. Goodall has led the way for community-centered conservation, research and education, and will explore her Reasons for Hope for this and the next generation. The event will be held in the Carole and Barry Kaye Auditorium in the Student Union on the FAU Boca Raton Campus. For tickets and directions, please visit https://bit.ly/2EjGsSH. What an incredibly amazing evening! Oh I wish I knew about this earlier! one of my heros! Will there be any returns do you think?